Owners Herm and Wilma Young’s love of farming paired with their appreciation for wine set the wheels in motion several years ago. Herm is a fourth generation fruit farmer; Wilma’s home is in Rhine River valley in Germany. 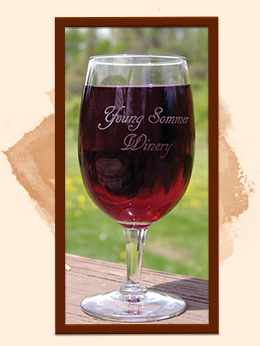 Her relatives have always made their own wine, and wine is an integral part of family traditions. “Wine is revered as much as beer in Germany. There isn’t a family occasion that isn’t celebrated without the warmth of a glass of wine. Even as a child I was included with a tiny glass of my own to celebrate with everyone else…it was an all-inclusive family kind of thing,” Wilma notes. As they toured the wineries of the Finger Lakes region, their thoughts about starting a winery began to evolve. “We’d stop here and there and taste and listen to the winemaker and sales staff share how this wine tastes like cherries or apples…with a hint of pears. I thought if grape wines taste better because they have the spirit of another fruit, why don’t they make wine from these fruits. I was told people don’t want fruit wines…they are cheap and don’t compare to grape wines. H-m-m-m I thought…and I didn’t understand,” Wilma shared. The tide turned in a major way when Herm and Wilma renewed an old friendship with Williamson’s Jan Klapetzky. They had met Jan years ago when he was their older sons’ Cub Scout leader. “ Jan has been an extremely successful and respected home wine maker for over three decades”. Wilma recalls, “Jan is a very congenial fellow and invited me down to see his cellar – an amazing place with an older stone foundation, dirt floors and a small stream running through. Jan was very proud of his winemaking ability and shared a sip of this one and a glass of that. It was a most enjoyable visit.” Not long thereafter Jan offered a winemaking course, Herm and Wilma attended. It was all about grapes, but Herm persisted and convinced Jan they should try to make apple wine. That wine (made with Senshu Apples, an Asian hybrid) was the first gold medal wine at the New York State Fair competition that was produced by them together. Herm was hooked. Jan was impressed, and Wilma was convinced they could make fruit wines and people might like them. But, of course, the winery could not be just about fruit wines so experimentation with vinifera and hybrid grapes ensued. Herm and Wilma dreamed of opening a winery on their small farm but that was going to be tough because Williamson was a dry town at the time. Jan, Wilma, Herm and several others worked hard to petition the town to offer a referendum to allow Farm wineries and the people of Williamson agreed that we should be given the chance. The dream became ever more possible. Jan Klapetzky is one of those intelligent guys – a retired Kodak chemical engineer – who has used his genius to enhance a life-long hobby for making wine. Klapetzky has been making wine in earnest for nearly 40 years, although he started way before then. 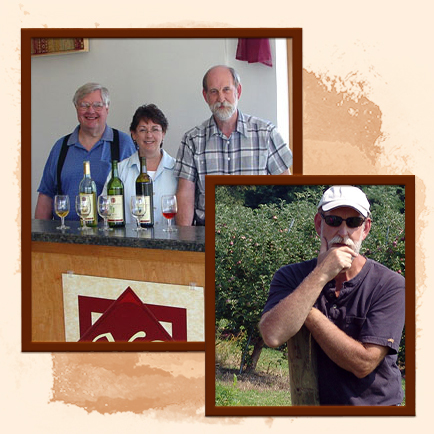 Jan’s winemaking began as a 10 year old when he started a batch of hard cider using bakers’ yeast. “My parents caught me and scolded me, but when I looked out my bedroom door I saw they were drinking it,” he shared. Klapetzky grew up in Syracuse, NY. After completing a Masters in Chemical Engineering, Jan moved to Rochester for his new job at Eastman Kodak Company. He made a friend who had a little vineyard (actually it was his aunts), and was pressing the grapes and making wine in his garage. “That was fun,” Jan continued, “so I took a couple of courses and purchased juice and started experimenting on my own.” It was trial and error at the beginning; some wine was just awful, but most was palatable and with each batch Klapetzky learned something new. Nights and weekends, the chemist worked away in the basement of his 130 year old farmhouse using this yeast or another, fermenting his concoctions… and all along the way his process evolved, improved, and his wine started getting a reputation among family and friends. Jan’s winemaking hobby has included membership in the American Wine Society; he is a past chairman of the Rochester chapter; he judges at a number of major wine competitions. Klapetzky shares his knowledge and has taught several winemaking courses.